The secretary desk is known by different names. Some refer to it as secretaire while others call it escritoire. Whatever you choose to call it, the purpose remains the same. It is a type of furniture that is essential in the home or any working space. It comes with a hinged desktop surface that can be used as a bookcase or writing desk. Do you need help to determine the value of your antique secretary desk? Submit info on your antique secretary desk or read more information below to understand how to determine the value of antique secretary desks. There are many antique secretary desks with hutch that are available for sale today. But before you take the plunge, it is important to learn more about what a vintage secretary desk is and how you can determine the authenticity of its age. What is an Antique Secretary Desk? · Bureau – This is the first type of antique typewriter table that was introduced into the market at the turn of the 18th century. The design integrates that of a chest drawer. Over time, there have been numerous designs introduced into the market including ones with writing desks that can be lifted off. · Antique Writing Table – This is the next type of secretary desk that were available sometime in the 18th century. · Partners Desk – The name for this type of secretary desk is derived from the fact that it was designed so two people can use it. It was innovated in England in the 19th century, which was designed for banking partners. This type of secretary desk made from a wide range of wood. A common characteristic is the presence of working drawers and cupboards on opposing sides. 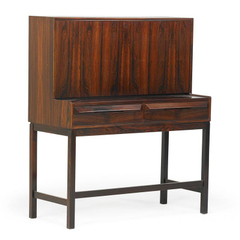 · Carlton House Desk – This is one of the best examples of classical English furniture. The original design was a creation of George Hepplewhite during the 18th century. He created the design for the Prince of Wales and was named after Carlton House in London. It comes with a practical design that is U-shaped with a wide writing surface. In addition, it comes with cubby holes, small drawers, and two side boxes. · Gillows Desk – This style of secretary desk is suitable for modern interiors due to the clean and minimal design. Other unique features to this desk include refined narrow top and fluted legs. · The Davenport – This is the final type of antique secretary desk to consider. This type of secretary desk gained popularity during the Sheraton period, which was from 1780 to 1800s. According to history, the name was derived from Captain Davenport who have commissioned the first example for this type of desk. Davenport desk is characterized by a sloping desk atop a case of drawers. When you pull that desk out, it will provide a kneehole. If you are looking for other more specific types of secretary desk, you can look at specialty stores dedicated to selling antique furniture. · Originality and Authenticity – Unfortunately, there are many replicas or reproduction furniture out there that are being sold as the authentic piece. This is what you need to be wary of when buying antique furniture. You must educate yourself first about the signature that is often associated with certain types of furniture, particularly those made by popular furniture makers. It is also important to ask about the provenance of the item. If it comes with a paperwork, you can be more confident that the item is authentic (versus without it). · Type of Wood – There are several types of wood used for constructing antique secretary desk. Most are made of oak or cherry. If you choose to buy oak secretary desks or cherry secretary desks, they will vary in look, price, and durability. · Craftsmanship – This pertains to the amount of detail that went into the creation of the desk. From the handle to the drawer linings, these factors add to the value of the furniture. The authenticity of wood secretary desks is the single most important factor that affects its market value. No matter how well constructed the desk is, if it is a reproduction, it will still cost less than the original. There are several ways to authenticate the antique secretary desk. The first tip is to look for evidence of the age. Any flaws in the look or signs of aging is a good sign when you are buying wood secretary desks. On the other hand, if the desk looks new or freshly painted, it is probably a reproduction. As mentioned above, any paperwork that would support the claim to the furniture’s authenticity and provenance would help. Make sure to ask for it before you part with your money on antique desks. Finally, you must choose a reputable antique dealer. The business must have proper certification. This will ensure that they abide by a strict code of conduct so you can guarantee the authenticity of the antiques you buy from them. The value of an antique desk can be heavily influenced by a number of things. When you buy antique typewriter table or desk, you need to thoroughly inspect the item. To the uninitiated, all antique furniture are the same. However, experts know that the smallest alteration can cause an antique object to losing authenticity, and eventually drop its value in the market too. 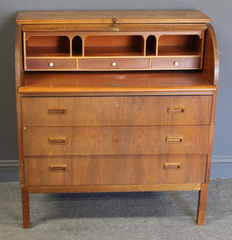 The first thing that can affect the value of vintage secretary desk is the furniture maker. There are a few notable furniture makers whose creations are coveted by antique collectors today, such as Chippendale, Roberts, Edwards, and Gillows. If you happen to own a piece of furniture from these famous furniture makers, you can expect the value of that antique item to increase significantly. The quality of workmanship is another factor, too. This will explain why some antique secretary desks value are higher than others even when it was manufactured at around the same time. The level of detail and craftsmanship involved in making the furniture can have a significant impact. Any other special features such as artist signature or detailing that are made with rare materials can add to its overall value. The rarer the furniture is, the higher it's value!